The 15 March Trip Client's video! The Photo of the Week! Due to Sinai storm 18.01.2010 the Lost Land big canyon had deepened for few meters. The Lost Land is a chain of picturesque canyons located on the north of the Sinai Peninsula. Due to the state border vicinity, this area is rarely visited by tourists and you will hardly meet unguided groups hanging around. Therefore The Lost Land is perfectly preserved and remains pristine and beautiful as it was created by Mother Nature. This area, located at 1000 meters above sea level, was once the seabed. Dozens of coral formations in the rocks and fossilized shells, remind us about ancient times. A mixture of rocks and corals creates fantastic patterns. Water, wind and time have done a great job, giving canyon walls fantastic shapes. Weathering of the soft sedimentary rocks has created plenty of caves and crevices, adorning the walls by mysterious drawings. Nature has created amazing eagle-shaped and cup-shaped rock sculptures in this area. However, this area was not always a desert. For centuries the Lost Land was on the main route from Africa to the Middle East and back. Thousands of years ago troops of the Egyptian Pharaohs have been using this route to reach the Middle Eastern countries. Later on Arabs and Persians did just the same on their way to conquest of Egypt. Lately large numbers of Muslims all over the African continent was joining trade caravans on their pilgrimage to Mecca. Rock paintings here are the evidence of human presence; they bring us back to the times of the Roman Empire. You can find some photos of the canyons, passages, rocks and fancy-shaped stones in our gallery. You will have a unique chance to see much more and share your photos with us. Description - There are just a few places in the world where a visitor is confronted with a desert landscape as spectacular as that of the Sinai desert. 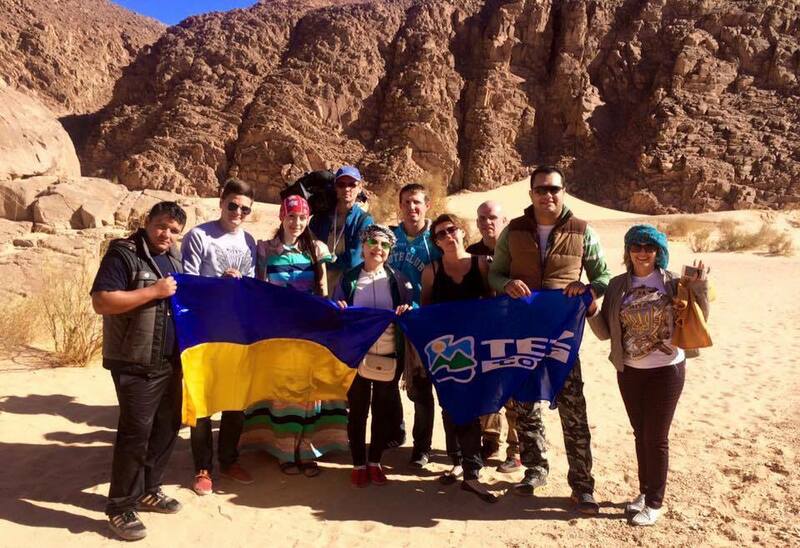 Join4U*jt us on an unforgettable journey into one of Egypt's most amazing natural attractions.... Sinai's Lost Land. This thrilling adventure will give your guests the opportunity to experience something totally unique in the fascinating desert of the Sinai Peninsula. On our journey to The Lost Land, guest will have the best of all the Sinai has to offer in just one day-the spectacular sea views, sand dunes, mountain ranges and shimmering desert. The stunning coastline drive from Dahab to Taba, the amazing natural Fjord lagoon where the mountains meet the sea and the historical Saladin Castle are all sights that most first time guests do not get an opportunity to experience and even repeat visitors to Sharm el Sheikh have yet to have a chance to discover. This exclusive and unforgettable excursion is one of a kind in Egypt as our company has sole access to the lost land, meaning that overcrowding with other tour groups will never be an issue. Your guests will enjoy an unforgettable and fun day out with plenty of unique photo opportunities for those all important holiday snaps! This unique experience is not available with any other tour operator in Egypt and is a 'must do' tour whilst on holiday here in Sharm el Sheikh.